New Residential (NRZ) offers a very tempting 11% yield, but before diving in headfirst, investors should be aware of the big risks that this mortgage REIT faces. After explaining how NRZ makes money, this article reviews six big risks, followed by seven reasons why NRZ is attractive and may be worth considering. Note: This report was originally released to Blue Harbinger members on June 16th. NRZ invests in higher yielding residential-mortgage-related assets that offer steady longer-term yields (this is how NRZ supports its big dividend), as shown in the following graphic. Specifically, NRZ’s largest investment class is Mortgage Servicing Rights (“MSRs”). If you don’t know, an MSR provides a mortgage servicer with the right to service a pool of mortgage loans in exchange for a fee. NRZ was a pioneer of this asset class following the housing crisis and all of its subsequent complex regulatory requirements. This is a lucrative asset class (as evidenced by the high yields in the table above), and NRZ is one of only a few companies with the scale and sophistication to be a leader in this space. For more information on MSRs and NRZ’s other investment types (which are much easier to understand than MSRs) check it out these explanations on NRZ’s website and also the graphic below. The “Coupon Rate” column in the following table shows the low rates NRZ pays on the loans it uses to invest in its higher yielding assets. With interest rates ranging from 3.5% to 5.6% its easy to see how NRZ generates all that cash to support its big dividend payments (i.e. NRZ earns the spread between the yield on its investments and the cost of its debts). And for more perspective, here is the amount of debt NRZ has taken on relative to its investments in each of its segments. These debt-to-asset ratios by business segment add some color to the amount of risk for each asset class (i.e. if there’s less debt to assets that’s a good indication that those assets are more risky (more on risks later). And for still more perspective, here is a look at the total amount of NRZ debt and when it comes due (this will be important when we discuss risks, later). Specifically, debt servicing is a much bigger use of cash than the dividend payments. And for more information, here is a more granular look at “uses of cash” in table format. As would be expected for a mortgage REIT, the uses of cash are tight (i.e. there is not a ton of cushion), and this will be important later when we consider risks (particularly credit spreads). Nonetheless, the economics of NRZ’s business is attractive (as we’ll discuss more later), but first here are the big risks that NRZ faces that investors should be aware of. NRZ’s dividend yield is high for a reason (i.e. it’s risky). For example, if there wasn’t much risk associated with MSRs, then they wouldn’t offer such high yields (because the market would have arbitraged it away). Granted, NRZ deserves some credit for the high yield due to its first mover advantage (they essentially pioneered the industry), the low levels of competition (not many other companies have the scale and sophistication to compete), and because management is smart (they’ve continued to evolve with the evolving mortgage industry), but remember that NRZ was only able to get into this business in the first place because big banks were forced to “de-risk” after the housing crisis by selling off risky mortgage servicing business (and NRZ was willing to take on that risk). And as a related risk, big banks may soon get back into riskier investment types (such as MSRs) as the current White House and Congress look to roll back regulations (such as parts of Dodd Frank). Growing competition from big banks is a risk for NRZ. 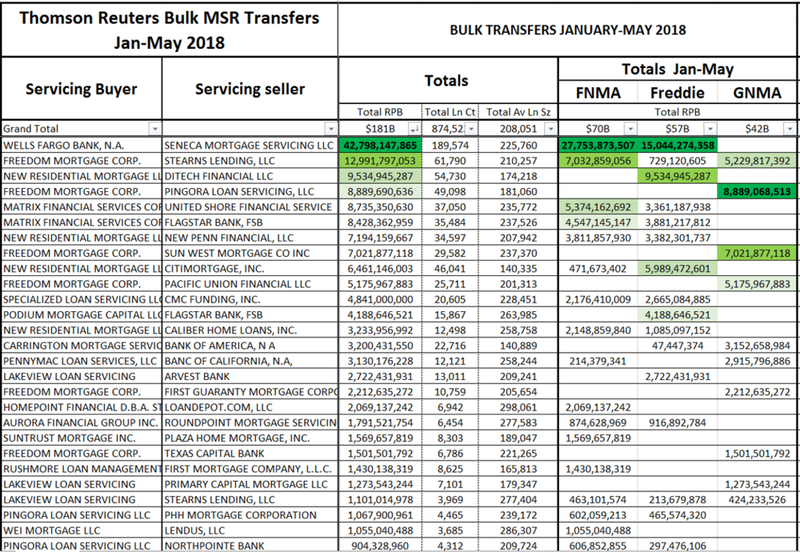 And for perspective, the following tables show the year-to-date mortgage servicing buyers, and Wells Fargo (a big bank) is leading the way (Not NRZ). From a competitive perspective, Wells Fargo has much deeper pockets than NRZ, and that could become a growing risk (i.e. more competition from big banks). As of December 31, 2017, an immediate 50 basis point increase in short term interest rates, based on a shift in the yield curve, would decrease our cash flows by approximately $11.4 million in 2018, whereas a 50 basis point decrease in short term interest rates would increase our cash flows by approximately $13.7 million in 2018, based solely on our current net floating rate exposure and assuming a static portfolio of investments. Widening credit spreads would result in higher yields being required by the marketplace on financial instruments. This widening would reduce the value of the financial instruments we hold at the time because higher required yields result in lower prices on existing financial instruments in order to adjust their yield upward to meet the market. If spreads blowout it could become challenging to refinance debt because loan to values will be less attractive. For some perspective, NRZ sold-off hard in late 2015 and early 2016 when credit spreads last widened significantly. And even though NRZ’s assets are not your typical high yield investments (because they’re residential mortgage related) they’re still high yield and sold-off in sympathy, as shown in the following chart. Also, the “Non-Agency Spread” line in the following table gives some perspective about where we are with regards to NRZ’s mortgage-related higher-yielding credit spreads. The assets that comprise our asset portfolio are generally not publicly traded. A portion of these assets may be subject to legal and other restrictions on resale or otherwise be less liquid than publicly-traded securities. The illiquidity of our assets may make it difficult for us to sell such assets if the need or desire arises, including in response to changes in economic and other conditions. NRZ has benefited from being in the right place at the right time (i.e. they got into the MSR business when credit spreads were wider and shrinking, and when banks were selling off mortgage-related investments at attractive low prices due to new regulations). However, the market has moved beyond the early-post-housing-crisis days, and the opportunities may not be as attractive going forward. Not only are credit spreads currently compressed, but if the housing market slows, spreads will widen, NRZ assets will decrease in value, and its share price (and eventually its dividend) will face pressure. Also banks may continue to re-enter the space more aggressively (as we saw Wells Fargo in our earlier table) especially if regulations are rolled back thereby allowing big banks to take on more risk. 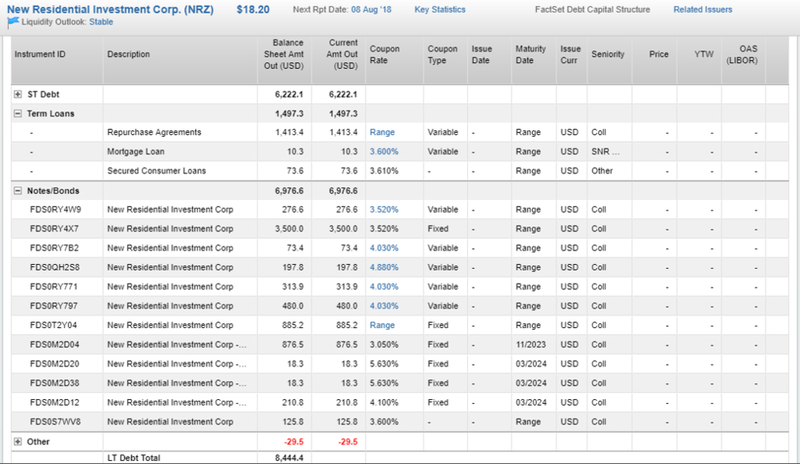 The above table also provides more color on the size and weighted average life (in years) or NRZ’s total investments. NRZ is a unique business, and management deserves a lot of credit for being a post-housing-crisis innovator in this space. Further, management has continued to evolve with the industry as NRZ’s book evolved from MSR’s, to excess MSRs, as well as the recent acquisition of an actual mortgage servicer which could prove very valuable as the market cycle and industry continue to progress. As we saw earlier, the yields NRZ earns are much higher than its cost of capital. This is because NRZ is willing to take on the risk, but also because NRZ is smart and innovative for building out a leading platform in this relatively new industry. As long as credit spreads don’t blow out dramatically, NRZ shouldn’t have any problems maintaining its big dividend. According to NRZ latest investor presentation, they have a robust pipeline and potential opportunities across the $26 trillion U.S. housing market. Or more specifically, NRZ believes the approximately $10 trillion mortgage servicing market presents a number of compelling investment opportunities. As long as NRZ continues to evolve with the industry, there should be plenty of continuing opportunities for growth. As mentioned earlier, NRZ is one of only a few market participants that have the combination of capital, industry experience and key business relationships that seem necessary to take advantage of the opportunity created by the increasingly complex residential housing market. Specifically many banks exited this business shortly after the housing crisis, thereby creating less competition for NRZ. For reference, we saw a handful of NRZ’s competitors (most of them much smaller) in our earlier table of year-to-date mortgage servicing buyers. The housing market, and the overall economy, remain strong, and another housing crises seems unlikely, especially considering all of the new regulations and risk constraints that were put in place. Also, rising interest rates will likely reduce mortgage pre-payment speeds, thereby increasing the value of NRZ’s MSRs. Further, the sheer size and lack of competition in the mortgage asset servicing space should help NRZ remain a leader in the space. If credit spreads were to widen significantly—that would be concerning, but it also seems unlikely we’ll experience anything as severe as the last housing crisis anytime soon. For what it’s worth, all seven of the Wall Street analysts currently covering NRZ have a “buy” recommendation and believe the shares should trade higher, as shown in the following chart. We’d be remiss not to explicitly mention the attractiveness of NRZ’s big dividend. And even if the market gets a little jittery, and credit spreads widen, and the value of NRZ’s assets and stock price both decline, the assets will likely keep producing the income necessary to continue supporting NRZ’s big dividend. Specifically, it would take somewhat extreme conditions for the dividend to be reduced in the near-term, and it will likely sustain and grow in the long-term as long as NRZ can keep evolving with the large and evolving residential mortgage market. For perspective, the following chart shows NRZ’s dividend per share has increased as its market cap has increased, and the dividend yield is currently reasonable relative to its historical levels. 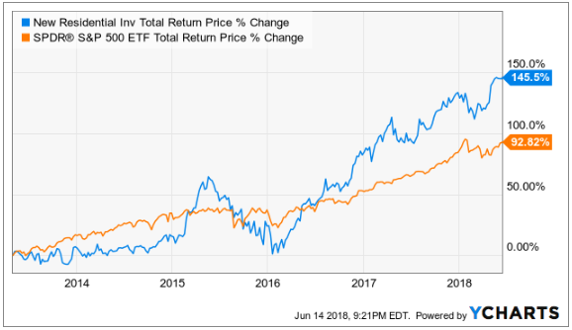 New Residential is able to offer a big dividend yield because the company continues to be a smart innovator in an evolving industry. In our view, NRZ faces both risks and has attractive qualities, as described in this article. However, the biggest risk is if credit spreads widen so dramatically that NRZ’s asset values fall far enough that it isn’t able to refinance its debts and is thereby forced to cut its dividend to free up cash. However, that scenario seems extremely unlikely, especially considering our current strong market environment. Nonetheless, we continue to monitor the market and NRZ closely. We have owned NRZ in our Blue Harbinger Income Equity portfolio since May of 2016, and we have no plans to sell any of our shares at this time (we'd consider adding on a pullback). Further still, NRZ is a unique high-yielder, and we believe it can add significant value to an income-focused portfolio. For this reason, we have added NRZ to our list of 5 Attractive High-Yields from across the capital structure, which includes preferreds, debt and equity opportunities. We are most certainly not advocating for an over-diversified "closet index fund," we're simply acknowledging that it can be beneficial to consider attractive high-yield opportunities from across the capital structure, especially if you are an income-focused investor.